There was a time when building owners focused on design elements in public areas but considered their restrooms as strictly a utilitarian space. 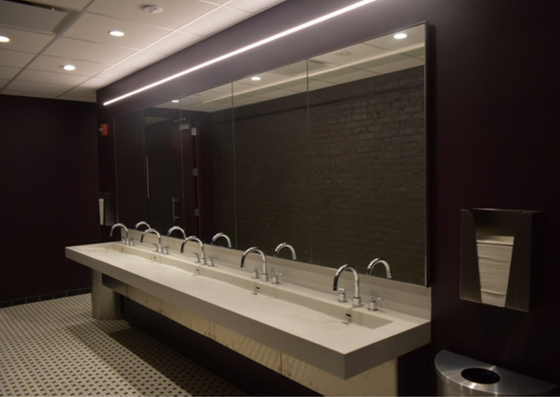 Today’s building owners understand the appearance and usability of bathrooms has a significant impact on how patrons perceive a building or business. Because restrooms are a frequent necessity, they offer many opportunities every day for a business to present an attitude and philosophy. But it is not just customers and guests you want to impress. The University of California at Berkeley’s Center for the Built Environment study found there is room for improvement when it comes to the bathrooms companies provide their employees. While most responses pointed to cleanliness, manners, and privacy, it’s clear the bathroom is a point of concern when it comes to employee satisfaction. Sustainability, Hygiene, and Functionality are qualities that patrons expect businesses to prioritize in their restrooms. Follow the links below to dig deeper into four current design trends for commercial building owners. These restroom design trends focus on four distinct areas of consideration in commercial bathroom design; sustainability, universal design, vandal resistance, and hygiene. At Neo-metro we believe that good design includes all these elements, and that aesthetics need not be sacrificed to achieve excellence in all four. Sustainable Design - Water-efficient fixtures and carefully chosen materials show the value a business places on sustainability and conservation of resources. Universal Design - The Universal Design trend is leading the way in commercial and hospitality restroom design, with the goal of creating a built space where all are welcome regardless of their age or ability. Universal Design goes beyond the minimum accessibility requirements set by law. Read More. Vandal Resist Design - Public restrooms see a lot of wear and tear. By using vandal resistant products and fixtures, your bathroom can stand up to just about any use or abuse while still looking good. Hygienic Design - A clean and spacious restroom leaves users with a favorable impression of the building as a whole.